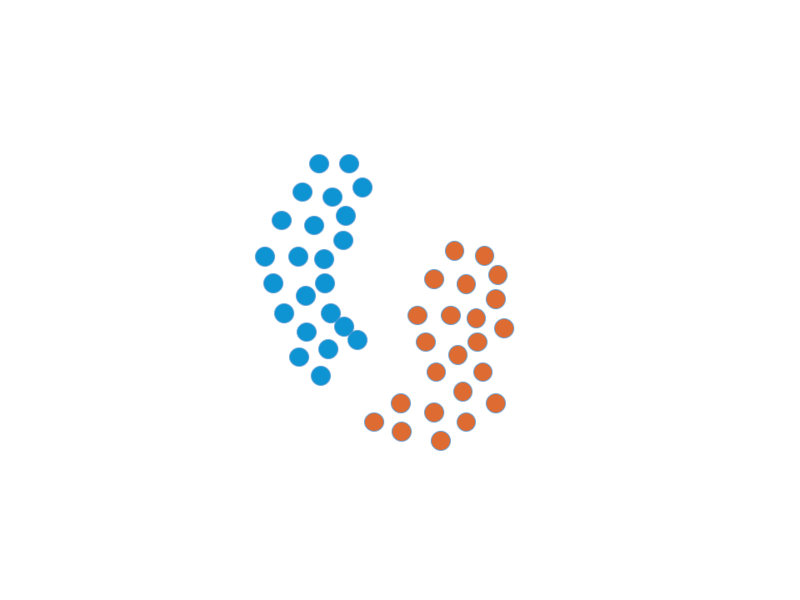 This blog post on the Agglomerative Hierarchical Clustering algorithm (which is a clustering algorithm) is part of the blog post series Understanding AI Algorithms. Sometimes when looking at a set of data, the number of clusters isn’t distinct. This is where agglomerativehierarchical clustering is useful. Imagine that you just launched a new product and you don’t know how the customers are using it. You want to study this, but because it is a new product, you don’t have much knowledge on customer behavior. Instead of being told how many clusters there should be, hierarchical clustering seeks the appropriate number of clusters first. 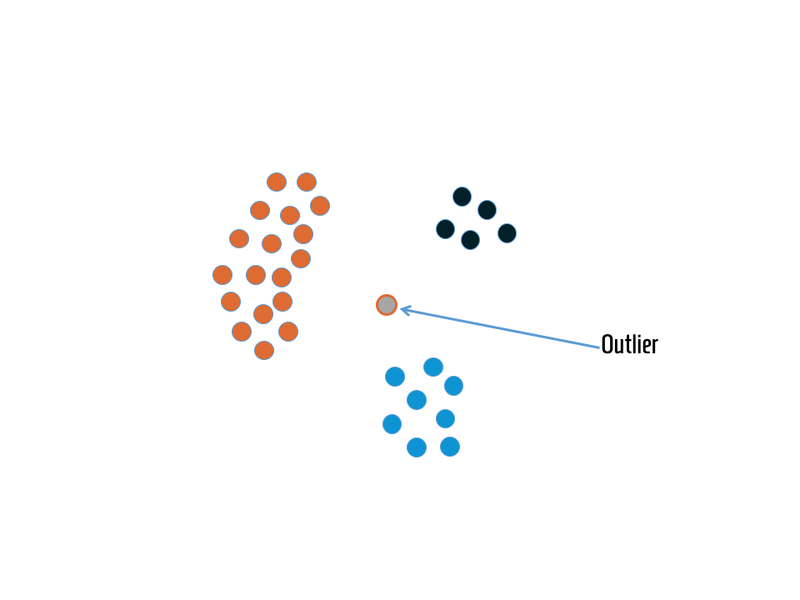 By starting with a collection of unclustered data or observations, the points are then merged one by one until all observations are in the same cluster. This is done by taking the nearest clusters in each step and grouping them together. For example, imagine a hundred people spread out on a football field. At the beginning, they each stand by themselves, essentially meaning there are a hundred clusters (each with one person). The two people closest to each other are then asked to move together, which reduces the number of clusters to ninety-nine (one cluster has two people). Eventually, if you repeat this instruction enough times, there will be single cluster with a hundred people. The same approach is used for customers when studying purchasing habits. Each merging is then studied to determine the right number of clusters for the issue at hand. This is done by examining how far away the clusters were when they merged. On the football field, the first people clustered together were close already, but after a few more times merging with groups, the distance between the different clusters will grow. You may have a large cluster at one end of the field, and another at the far end. This system lets the data scientist decide how many clusters to use after establishing how far is too far for clusters to merge with each other. In marketing terms, this means it creates groups of different types of customers, but focuses on deciding how similar they have to be to target in the same way. For example, you might target an ad for a barbeque at young families living in rural areas and older couples in a suburb because they share the attribute of having outdoor space for cooking. However, you would not target the ad to young families or older couples living in an apartment building. Agglomerative hierarchical clustering does not require initial centroids or prior knowledge of the number of clusters, which reduces the amount of analysis required on the data before using this approach. Although we won’t get into them all here, there are different techniques to choose from, depending on what is appropriate for the data set. This makes it more flexible and provides an opportunity to explore and find the appropriate algorithm. On the downside, the algorithm cannot handle large data sets, which makes it less useful for some tasks. This blog post on the DBSCAN algoritm is part of the article series Understanding AI Algorithms. DBSCAN is a clustering algorithm. The density-based spatial clustering of applications with noise algorithm (DBSCAN) uses clustering by finding groups of observations with a high density, meaning they are not spread out. This is appropriate if the clusters can be assumed to have different shapes. This differs from k-means because it can accommodate different shapes in data instead of only round clusters. This allows an analysis to pull other observations from the data and help to find similarities that can otherwise go unnoticed. DBSCAN requires two parameters. The first is called epsilon, which looks at the maximum distance away a data point can be to still be part of the group. The other parameter is MinPoints, which dictates the minimum number of similar observations in a group required to be included in that cluster. So, if you set MinPoint to five, then even if an observation has a distance less than the epsilon to three observations, it would still be excluded from the cluster. As you might notice, DBSCAN doesn’t require that we tell the algorithm how many clusters to find. Not having to select the number of clusters simplifies the task of getting new information out from data and reduces the risk of missing out of important or hidden knowledge. This sounds complicated, but these types of clustering algorithms have a unique function in marketing. For instance, they can used to recommend products to a cluster of customers based on what they have previously purchased. If one customer in a cluster has purchased product A and product B, and another customer in the same cluster has purchased product A as well, then we could recommend product B for the second customer. Amazon’s site does something similar when it recommends purchases based on what other people bought. This blog post on the K-Means algorithm is part of the article series Understanding AI Algorithms. K-Means is a clustering algorithm. K-Means is an algorithm that segments data into clusters to study similarities. 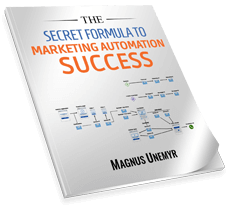 This includes information on customer behavior, which can be used for targeted marketing. The system looks at similarities between observations (for example, customers) and establishes a centroid, which is the center of a cluster. The algorithm then determines the similarities between for example customers by assigning clusters belonging to each observation to the nearest centroid. An appropriate measurement (defined by the data scientist) is used to determine the distance between observations and centroids. Don’t worry if that doesn’t make sense—we’ll get there. Let’s go back to the outdoor concert mentioned in an earlier article in this blog post series. This time, instead of trying to determine a previously known group like we did when classifying a person’s country of origin, we want to know if there actually are groups of similar people in the audience. When we begin, we don’t know what clusters exist, meaning we don’t know what characteristics to use to group people in the crowd. However, perhaps we find that close to the stage there is a group of people (cluster 1), by the side is another group (cluster 2), and in the middle is a third group (cluster 3). Once we recognize that these clusters exist, we can then find out what variable keeps them together. Perhaps cluster 1 is a group of friends, cluster 2 is a school class, and cluster 3 is a mix of people who bought their tickets at the same time and ended up standing together. To train a model, the algorithm first needs to know how many clusters to segment the data into. Choosing the right number of clusters can be tricky and requires exploration and testing. When the number of clusters is set, K-means starts with randomly assign initial centroids. Remember that we began by not knowing where the clusters are. To start, we randomly set one centroid (the arbitrary center of a cluster) to be in the back, one in the front, and one on the right side of the concert. From this, the K-means algorithm looks around the centroids to find the points nearby. It then updates where the centroids are located to try to find the middle of the groups that seem to exist. In the example of our second cluster, the school class, the centroid would try to find the middle of that group of people. Eventually, it finds the place in the crowd that is closest to all members of that cluster without taking in other people in the crowd. After all the adjustments are made, the algorithm sees that there can be no more refinement and stops moving. This is quite useful in marketing because it allows us to segment large groups of customers and study them based on their behavior or other shared attributes. It discovers commonalities that may not have been apparent before, allowing for more effective targeting and outreach. As with all approaches, there are advantages and disadvantages here. On one hand, K-means is easy to implement, meaning it can be experimented with and analyzed without a huge cost or investment of time. It has also been proven quite effective despite the risk that poorly chosen centroids can lead the model to become stuck in false clusters, meaning it thinks it’s found a cluster that is really two different clusters, for example. It is also useful because the algorithm can handle a huge amount of data. As we discussed earlier, the more data that can be used, the clearer and more accurate the results will be. Using an algorithm that can handle that scale is important. On the other hand, there are problems with K-means that can make it less useful in some cases. 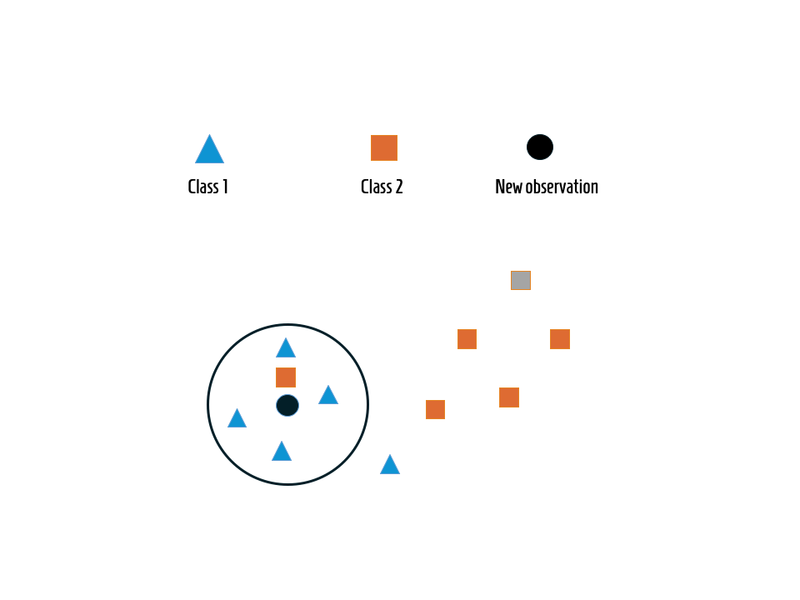 For example, it performs poorly when clusters of data are not round (when data points are scattered, for example if our school class doesn’t stand together in a circle at the concert), or when clusters have different densities, meaning when observations in some clusters are farther apart. It can also be difficult to determine how many clusters of data to use to create your desired result. Issues with the shape and distribution of clusters can be remedied in some cases by using the next in our list of clustering algorithms, called DBSCAN. This blog post on Neural Networks is part of the article series Understanding AI algorithms. Artificial neural networks (ANN) are the most complex of the algorithms we will cover in this article series, and our explanation has been simplified to avoid getting lost in the weeds of the issue. Simply put, they are inspired by the way human brains process information through a large number of interconnected neurons. Even though artificial neural networks can’t measure up with real brains, the method has proven effective for solving difficult problems like voice recognition, image recognition, and learning to recognize handwriting. Each neuron, also known as a node, receives input from one or multiple nodes within the network, or from an external source. Each input has its own individual weight, or importance. When receiving some input, the node applies a non-linear function, called an activation function, to the sums of its weighted input and produces an output. In simpler terms, all nodes perform a computation on the information they receive. Nodes are divided into three different layers, as shown in the image above. The first layer, called the input layer, receives input (data) from an external source. The outputs from the nodes in the input layer are then weighted and passed on to the second layer, called the hidden layer, where intermediate computation is performed. This step is complex, but for our purposes just know that the computation being done in the hidden layer uses weighted outputs from several nodes – that is, information from several places in the network. There can be a number of hidden layers and the complexity increases with the number of hidden layers. 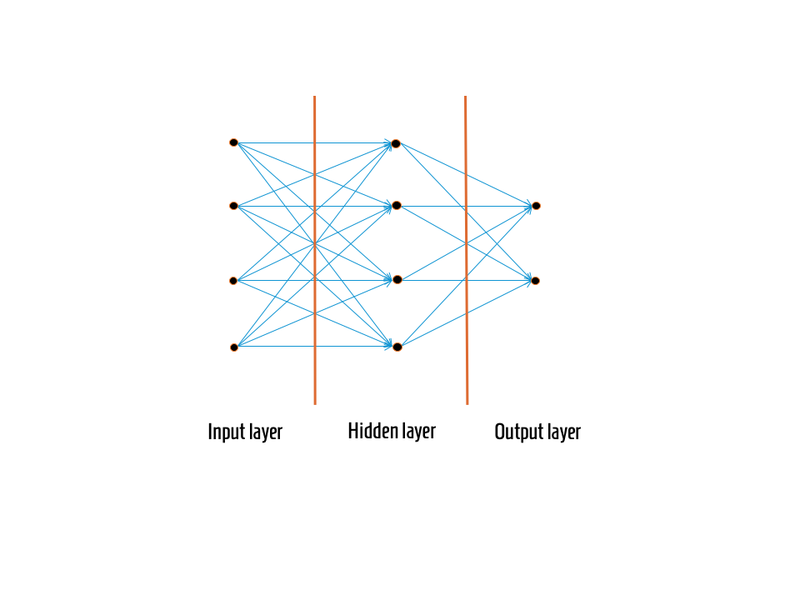 When a neural network contains more than one hidden layer it is referred to as deep learning. The output from the nodes in the hidden layer(s) are also weighted and passed on to the output layer, where the result is computed. By performing all these computations in different steps, the algorithm can find hidden patterns in the data. There are several computations in different steps, in which the output from one computation is “merged” with the output from other computations, and these are computed together to get a new output. In other words, information doesn’t go through a neural network in a straightforward way, as we saw with other systems. Here, the information is used for calculations at several points, and the results then feed back into the system for further analysis. With this complex structure, neural networks can almost simulate how a brain process information, though not nearly at the same scale. After training the network, the nodes then learn to react to different inputs. For example, if we input the information that a customer has been loyal to your company for ten years and lives in a big city, the nodes in the input will react to this information and send the reaction forward to the hidden layer. This will trigger a reaction (computation) in the hidden layer. The reactions in the hidden layer are then gathered in the output layer, which also creates a reaction. In this case, it may be that the customer is likely to use the online shop. Artificial neural networks are complex and hard to grasp at first sight, and we can only scratch the surface of them here. Using this type of algorithm demands a lot of trust in data and in the data scientist. The issue is that as a business executive, you cannot count on understanding the conditions for a certain outcome. However, this is also the advantage of using an artificial neural network: they can handle relationships that are more complex than what can be explained without them. Artificial neural networks have a complex structure that gives them the ability to detect hidden patterns and non-linear relationships, and to work well with classification. Due to their complex structure, artificial neural networks can find relationships that would be hard, or even impossible, to assume from the beginning and therefore could be missed when using a simpler algorithm. Although neural networks may work well for some problems, they are not suitable for all. Sometimes a task requires interpretation and explanation, and since these types of networks are based on many connections and computations, it is hard to explain what the results are based on. Even if the task does not require explanation, it can cast doubt on the output of the model when its function is too complex to understand. Data scientists can test the result by comparing predictions with observed outputs, but this isn’t always enough to justify the model’s downsides. Another issue is that it takes time to train a model, and as the number of hidden layers increases, the model becomes increasingly complex. This creates the risk of overfitting and increases the required investment in time and money. Clearly, neural networks are an enormous topic onto themselves that fills whole books. Here, we’ve looked at some of the key attributes of these systems to help show how they differ from other forms of classification. Next, we’ll look at a concept called clustering, which is another way to group and analyze data used by AI systems. This blog post on Naive Bayes algoritm is part of the blog post series Understanding AI Algorithms. Naive Bayes is a classification algorithm. Unlike the other classification algorithms described in the other blog posts in this series, the naïve bayes classifier uses a straightforward statistical approach. It builds upon conditional probability theory, where an observation is classified by computing the likelihood of it belonging to a certain group. Let’s say we want to know what type of platform a certain customer is most willing to use to find information about your company. They may use their computer to look online, use the browser on their smartphone to read the mobile site, or load your company’s own app. Based on the attributes of the observed customer, for example a female between 20-30 years old with a college education, the naïve bayes approach will compute the probability of that customer using a phone application, computer website, or a mobile website and classify her into the class with the highest probability. Naïve bayes is one of the tools used to do this, and it can be a helpful addition to our toolbox. Although the algorithm is called naïve, it is a faster way to classify information about customers based on probability, rather than relying on huge data sets. This helps reduce to load on the AI system and keeps the output manageable and effective. Since naïve bayes classifiers do not need a model to be trained, they are easy and quick to implement. This allows for testing on real data without spending a lot of time and money on developing the model. When implemented, they are quick to make predictions. The naïve bayes algorithm does not need much data to perform well and can be used on both binary and multiple class predictions, which further reduces the time and money spent on modeling. However, as the name indicates, the classifier is naïve. It requires assumptions that do not always hold up, which may cause the system to perform poorly. For our final classifier, we’ll look at neural networks. These are complex because data moves through them in elaborate ways, rather than the relatively simple systems we’ve seen so far. This blog post on the K-nearest neighbor algorithm is part of the blog post series Understanding AI Algorithms. K-nearest neighbor (K-NN) is a classification algorithm that is easy to understand and work with. Because it is simple, it is a good way to grasp the basics of machine learning and become familiar with the fundamentals of data handling and algorithm implementation. Like the other examples we’ve seen, this algorithm also comes with some downsides, and K-NN is not recommended for large data sets and complex problems. Even so, it can be appropriate for detecting outliers in data (called anomaly detection), to recommend content for system users (recommendation systems), and for search engines when trying to understand an intended search (semantic searching). K-nearest neighbor works by detecting and analyzing the nearest observations to the new data that you wish to classify. The K is simply the number of observations that the data scientist has chosen for the algorithm. For example, let’s say you’re at an outdoor concert. If a data scientist wants to predict which country you are from, the K-NN could be used to help narrow that down. Let’s say we set the K value to five. This means the system (or data scientist) will check the five people nearest to you to determine their country of origin. Let’s say that four of the people closest to you are from Sweden and one is from Norway. From this knowledge, the algorithm would assume that you are from Sweden because most of the people around you are too. Consider this example in the figure above where you are the black dot. Since K is set to five, we will check the five nearest observations (the square and triangular shapes in the circle). Since the majority of the five observations are triangles (from Sweden) and only one is a square (from Norway) you will be classified as a triangle (Swedish). K-nearest neighbor is a simple algorithm that is easy to set up. It is also flexible because the number of K neighbors and the distance between them are chosen for what is appropriate for the data being analyzed. However, it can be difficult to figure out which variables (attributes) to use for classification. If irrelevant variables are added, the calculated distance can be misleading and the model will perform poorly. This error can be reduced by weighting the variables (in other words, giving some more value than others in the model) by deciding which aspects of the issue are more important. K-NN also requires lots of computer memory space because the algorithm needs all the historical data points to predict a new observation. Rather than summarizing the data into a simple model, it compares older observations and classifies the new observations into similar groups. The complexity of this means the calculations can take a long time to produce effective observations.